Even today, I am disappointed that I never grew to be six feet taller or taller. In my generation, I've always been taller than average. Yet, much of my life I felt small, insufficient. I guess I wanted to be too tall to overlook. As a child and youth, adults frequently described me as shy and quiet-- which frustrated me as I have equally often been told to quiet down and "Please, just stop talking." In retrospect, I'm pretty sure I was ascribed reticence by people who just didn't want to get to know me. 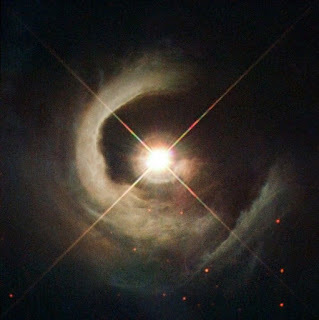 Hubble telescope image: "Hubble Sees a Young Star Takes Center Stage"
Yet the stuff in my head has always been so vivid and loud. And I've never been shy about talking. One of my oldest and dearest friends once called me her “favorite monologist” (in love, mind you, in love). It's not that it takes a while for me to warm up to people either. At a bustling writers' convention's keynote dinner, Jim and I landed a huge and empty table because it was awkwardly located in the hall. As the hall filled, people who had been buffeted from other tables with “Sorry, those seats are saved,” found their way to our table. The stragglers who ended up at our table were strangers before salad. Yet, by the time the rolls were out of the basket (not a euphemism), the conversation was rolling. Jokes were made and called back throughout the night. People were self-deprecating and insightful and candid. The conversation kicked into high gear with people eager to throw in ideas and land the next joke or tell the next story. I should add that none of us were attending as writers, some were fans, others volunteers. As our table really hit its stride and we were gasping to recover from a particularly hilarious incident, a best-selling author sitting among other luminaries of popular fiction at the adjacent head table said “I really wish I'd sat at that table.” And we, at the table of misfit toys, burst into another wave of laughter. When my kids were very small and just learning how to navigate in crowds, I spent a lot of time trying to keep them from being trampled. I wanted them to gain physical awareness of other people, crowds, and traffic patterns. One day when Scout was a preschooler and Rogue was a baby, I suddenly recognized that I was asking them not just to make way, but to recede. To become smaller. To take less room. As it sometimes happens in parenting, I had that laser-focused moment of recognition about *my own* issue- my sense of space. I've spent a lifetime apologizing for how much space I inhabit. It was a reflex. Immediately, I scaled down what I was teaching my kids. Yes, get out of the way, but remember you too are entitled to space. I want my kids, particularly my daughters, to know that they deserve a place in the world. If it's crowded, that place can be smaller for everyone; if it's open, that space can be larger. But they deserve a person's worth of space in the world-- though not preferably not on the stairs or in front of me when I'm carrying something heavy. Awareness and accommodation of others is still important, but it doesn't mandate sacrifice and apology in every instance. I spent almost forty years of my life giving up every shared armrest on a plane, or in a theatre. I've sat through productions with shoulders pulled in so the stranger next next to me can sit comfortably using the space in seat. I felt sorry for taking up space- even the minimum space I was allotted. So, I gave myself permission to exist in the physical world. And I guess I'm writing this now to make space for myself in the digital world again. When I started blogging about baby gear back in 2006, no one I knew read my writing beyond Jim. Though I was thrilled to have readers and moved away from blogging only about gear, I didn't really expect it. I made the blog because I was tired of writing out a whole bunch stuff for strangers who asked me about stuff I was using with my kids. The blog meant I could just refer them to the web site for more information. When there were a few readers, I got a chance to make jokes that my infant child couldn't appreciate. There was shop talk about the day to day of parenting. It was pretty joyful. Then people I knew subscribed. And it was weird, but not a big deal. Suddenly though, I had to think through my writing differently. People might take something for what it wasn't. There were new stacks of emotional baggage lying around just waiting to be toppled. When life turned upside down for us with medical stuff, I throttled my posts even more. Some days I wanted to pour out my heart and hear the insight my online community had to offer, but I knew the discussion would cause problems in my daily life. That put a chill on things. With great admiration, I've watched Anne Nahm write candidly about hard real life experiences. I think about the stuff she writes on families and life ALL THE TIME. It's honest and explores, like the parent-blogging community of yore, what is really happening in our lives- the kind of stuff you discuss with a friend over a meal about your parents aging and dealing with siblings. But Anne took the risk of knocking over those heaps of emotional baggage and told her sister about the blog. I so deeply admire that she's been able to cross the streams (a la Ghostbusters) and keep writing about those deeply important conversations we rarely manage to have but all so desperately need. I want to write like that. I want to talk about things that are important and happening in daily life, and to hear what others are thinking about similar experiences in our lives. It meant so much as a young parent to have an idea lab for those really hard things about being a parent. I miss that. But I've gotten completely tangled up in “no one wants to read this,” “is this worth writing?,” and “how will people in my real life interpret this?” to the point that I pared down to almost no writing at all despite the fact I loved the experience. It feels like I'm now asking if my ideas are good enough to take up space. On the internet. For free. And I've seen what's on the internet. I guess I'm asking the universe for permission to take up space again. I'm here to take up space. Come join me. Let's take up some space together. Adrienne, what a lovely post! I'm glad to see you again and so sorry to hear health stuff got you tangled up. I hope you keep writing here. FWIW, I ALWAYS think no one will care or want to hear my naval gazing, which is sadly true, but also liberating! Love you. Love when you write and process this life stuff with us!